George Gilder’s Wealth and Poverty, first published in 1981, remains one of the most influential books I have ever read. I never thought I would refer to this seminal study of supply side economics in a golf book review, but there you go. It came to mind while thinking about how to describe Larry Berle’s new book, A Golfer’s Dream: How a Regular Guy Conquered the Golf Digest List of America’s Top 100 Golf Courses ($14.95 SRP). That subtitle is a bit misleading, however. Berle is just not a “regular guy,” unless you consider a long-time, highly successful music and entertainment promoter as regular. As he explains it, for example, his efforts on behalf of New Age musician Yanni were highly profitable. The fact is, Berle’s work provided him with opportunities to meet his golfing goal that an everyday electrician or postal employee would never, ever have available to them. That is because of the class distinctions that are a significant element of many of the Golf Digest Top 100 Golf Courses, such as exclusive, private clubs like Fishers Island in New York, or the Wade Hampton course in North Carolina. To be sure, there are several great public courses on the magazine’s list, such as Bethpage Black, site of the 2002 U.S. Open, where plenty of regular folks play all the time. Nonetheless, without Berle’s background, and, especially his business connections, I truly doubt any middle-class golfer would be able to match this unusual feat. The reason this book reminded me of Gilder, however, is because Berle’s quest invoked a fundamental element of capitalist economics—the potlatch. As Gilder explained, capitalism is based on the assumption that a person will “give” something of value to others, without any more than the hope of a return on that gift. This was called potlatch in Native American cultures, but it continues today. Capitalism calls for people to risk their investment in the hope that someone will take advantage of their offer, leading to a profitable result for all concerned. Take the perspective of the folks whom Berle asked to play their golf courses. In many cases, all he did was ask politely, taking advantage of his ever-widening network of golfing buddies and business acquaintances. None of these folks had to say yes to Berle’s entreaties, yet he succeeded in gaining access to some of the most famous, yet fiercely private courses in America. What did these generous golfers receive in return? Nothing directly, at least to the extent Berle’s round-by-round stories are a complete version of events. On the other hand, by saying yes, these folks gained a new friend, a new connection to the world of entertainment and music, and perhaps an eventual reciprocal invitation for either golf or some other potential return on their “investment” in Berle’s adventure. Berle’s book follows his unusual golfing odyssey from the first few courses he could easily play, such as Pasatiempo and Pebble Beach, until he finally completes the list with a round at The Atlantic Golf Club on Long Island. He keeps a detailed list of everyone he contacted for access to the private clubs on the list, and describes how they either agreed or failed to respond. As he continued, he kept the ever-growing list of contacts well informed of his progress. His network expanded as his list of courses played grew. It’s an interesting story, but one that could have been improved if Berle spent as much effort to describe the courses as he did in describing how he was able to play them. For some, such as the Wilmington Country Club course in Delaware, or Quaker Ridge in New York, there are no course descriptions at all. In addition, the book has no index or table of contents, forcing the reader to leaf through the text to find the story on a particular course. 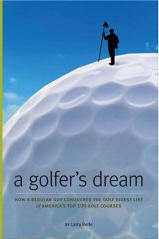 That said, Berle’s book is a useful guide to the power of personal networking in golf and other pursuits. It may prove to be inspirational for golfers who learn that it never hurts to ask.